Many of the auto makers are moving towards US for marketing their auto products. As a part of this, July 2010 sales have increased. Apart from the local manufacturers, auto makers all over the world are finding US as the best market for increasing their sales. Toyota, the Japanese world famous automaker, is going to release its new version in US, the lilliputian car the sub compact iQ , Scion iQ in US. After the car was exhibited in the New York Auto Show 2009, this model is going to be launched in March 2011. 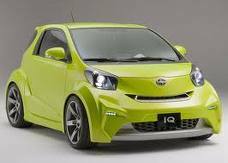 Already, the car was previously marketed in Asia and as well as in Europe, with the name Toyota IQ. The model has a great successful remark in Europe and Asia and it has been featured with the special features like adequate interior space and decent cargo spaces. It has started to be in pace with the direct rival Smart Fortwo. But, the features of the Scion iQ will be more. The car has 1.3 L four cylinder gasoline engine which produces the power of around 90 Horse power. A Continuously Variable Transmission(CVT) is provided in the car which is going to be marketed in North America for smoother acceleration. A rear window air cushion is also provided which safeguards the passengers at the rear end from accidents and is also provided with the automatic-clutched manual gearbox. Compared to the previous features of the car which were sold in Europe and Asia, it will have advanced features. New center console and Premium audio system will be found inside the car. So, thus the above features will make the launch of Scion iQ a grand success.